The Santiago Bernabeu fans enjoy the second goal fest in two matches since Zinedine Zidane became the new manager. Braces from Karim Benzema and Cristiano Ronaldo, and a goal from Gareth Bale earned Los Blancos all three points against Sporting Gijon. Bale opened the scored after just seven minutes as he darted to the near post to flick in a Toni Kroos corner. The goalkeeper came flying off his line, but was beaten to the ball by the Welshman. Only two minutes later Benzema flicked the ball into the Ronaldo’s path and the Portuguese fired a powerful shot into the top corner doubling Real’s lead. The hosts were on fire, and they scored two more before the 20-minute mark. Bale sent a cross from the right byline, which Benzema acrobatically sent skidding into the back of the net. In the next play, Ronaldo got his second as he received a low cross from Daniel Carvajal and easily helped into the net. Los Blancos were playing brilliantly, with Isco completing a superb match in the playmaker position. A couple of minutes before the break, the Spaniard sent a beautiful pass towards Benzema and the Frenchman prodded home from close range. 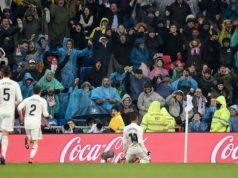 It looked like Los Blancos could net double figures again, but in the second half Sporting improved and Zidane men played more relaxed, especially after Bale and Benzema left the field injured. The visitors had a few chances and finally got their goal in a counter-attack that found Isma Lopez at the back post. The Spaniard rolled the ball inside Navas’s near post.